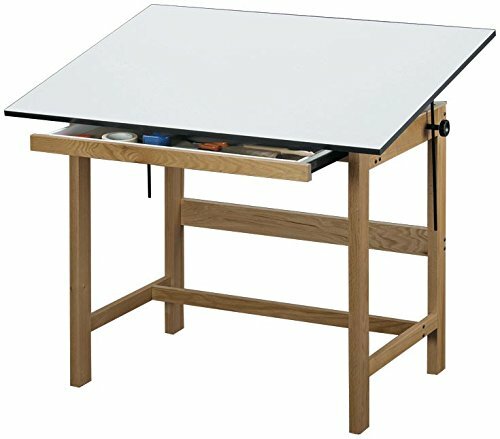 Attractive, functional, and durable, the Titan 4-post drafting table is constructed from the finest quality solid oak using through-bolt hardware to ensure it will withstand years of use. The natural finish is well protected by two coats of clear lacquer while the warp-free tabletop has a long-lasting Melamine laminate. Tilt mechanism enables user to quickly and easily adjust the top angle from horizontal (0) to 45. Inside dimensions of drawer (drafting height): 23 inches d x 31 inches w x 1 1/2 inches h. Dustcover protects drawer contents. Limited lifetime warranty. Top Size: 37 1/2 inches x 60 inches.